52 Ancestors, No. 27: John Hougendobler, Veteran of the American Revolution | Photo Restorations by Tim G.
Today is the Fourth of July, and I can not think of a better way to spend the day than to write up a short profile on the first—and so far the only—direct ancestor I’ve found to be a Revolutionary War veteran! There are bound to be more, but let’s start with this one: Mr. John Hougendobler, an ancestor of my paternal grandmother. I still have not yet launched into a full investigation of this gentleman, preferring instead to first find all of the primary documents that prove my relationship to him. I first learned of my relationship to him about five or six years ago, when a Google searches led me to the meticulously arranged website of Diane L. Hougentogler, who seems to have since passed on, unfortunately, and taken her masterpiece with her. Some remnants of her great work are still visible as cached pages in Google’s database, but i imagine that even those will be gone before long. The Grand Union Flag of Revolutionary times. Further assisting with the location of original documents has been the website of the National Society Daughters of the American Revolution, which has made available online genealogical data from many of its members’ applications over the years. I share ancestors with one of the Society’s former members, one Florence Hipple, whose application data is available here. For a mere ten dollars, I purchased a record copy of the original application, which lists not only the vital data of each ancestor leading to Mr. Hougendobler, but also the documents that Mrs. Hipple used to prove their relationships. I’m trying to track down each of those documents in order before launching into a full-scale investigation of Mr. John and his service. I think I have only a couple more to go, actually. Anything that’s good enough for the DAR, of course, should be good enough for me. So here is what I know about John Hougentogler, most of which came from either Diane Hougentogler’s website or one of its several imitators: John was born in Bern, Switzerland, in May of 1745, as the son of Nichlous Haugendobler and Helena Marie Mathews. Nichlous and Helena had at least three children in Switzerland before moving the family to America aboard the ship Osgood in 1750. They had at least seven more after settling in Lancaster, Pennsylvania. As far as I can tell, Nichlous and Helena’s three children—Anna, John, and Nichlous, Jr.—all landed feet-first upon solid ground in the New World. What is not clear to me, yet, is whether the Nichlous managed to pay the family’s fare or whether the family was sold into servitude. I can’t venture a guess right now, but it is something I will have to look into. Here is a ship. Maybe it’s the Osgood. Click for a transcribed passenger list. As far as concerns his Revolutionary War service, I know only from the aforementioned web sites that Private John Hougendobler was a member of the First Company in Columbia, Lancaster, Pennsylvania, which formed on September 1, 1775. According to Florence’s DAR application, he served under Captain James Barber. This artifact concerning a similar company in nearby Hempfield Township might entice the reader further, but I can not say more at this time. More research is in order. Having survived the Revolution, John married Catherine Boyer on the 26th of October, 1868, and the couple had at least twelve children. I’m descended from Joseph, whom I believe to have been the sixth child, born on March 3rd, 1782. Web sites indicate that John purchased 600 acres of land near the Wrightsville Ferry, but consulting the original source for that information suggests that perhaps an uncle of John’s actually did this. I need to look into that to clarify it. The land was in the family’s possession for many generations, so John might have lived there at some point. Remaining a military man, John became captain in 1897, and later served in the War of 1812. John died on the 12th of May, 1820, according to Florence Hipple’s DAR application. Had I located his grave, of course I would have used that for John’s featured photo. No, I have yet to find John’s final resting place, but I have found the graves of some of his relatives of his who lived around the same time. This leaves hope for finding the grave in one of my future bike tours of Lancaster County. 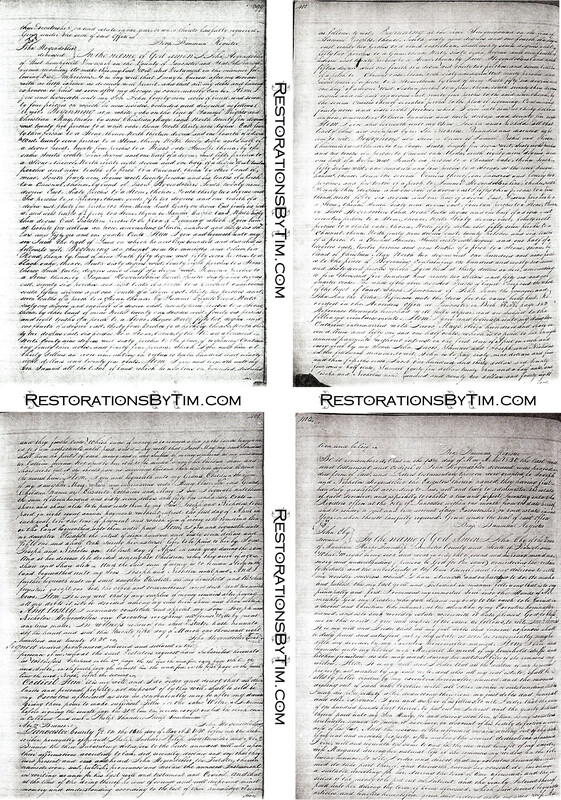 Signed sealed pronounced delivered and declared in the presence of us, who at the said Testators request have subscribed hereunto as witnesses Interlined on the 2nd page the eighth line the word, five, in the fifth page on the fourth line the word, [north], before signing. Boy, would I love to find the stones and hickories and chestnut trees referenced in this will, but I really have no hope of actually accomplishing that. Many thanks the the genealogists who have come before me, who have made my work so much easier, especially Diane L. Hougentogler, Florence Hipple, and the authors and editors of the Biographical Annals of Lancaster County. Thanks also to berserkers like John Hougendobler, his brothers, and all the other Revolutionary veterans who fought the world’s greatest army 238 years ago—and won.